Tele-Pod Head is an easy to use, telescope head for your camera tripod, providing smooth, balanced alt-az motion. 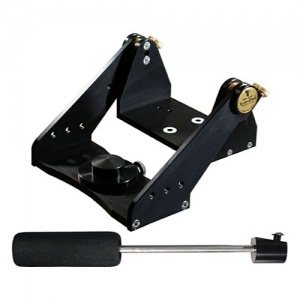 It is perfect for TeleVue lighter weight scopes and will work with TeleVue larger scopes at moderate powers. The Tele-Pod Head can be out tted with the Sky Tour computer (SKC-3000 and STN-4001) and Eyepiece Caddy Set (TEC-1018) with optional Sky Tour Caddy Plate (SCP-1019). The Tele-Pod head supports the scope and provides vertical and horizontal motions. It features smooth operating altitude and azimuth bearings with tension adjustments and a Delrin scope stop in case the objective end accidentally ___nose-dives." Both 3/8-16 and 1"4-20 attachment holes are provided on the bottom of the azimuth bearing.